What did you think of last week’s activity, “Just-So” Stories? Did you give it a try? Did you discover any new insights? Or was all that just too much work for a summer afternoon? This week’s activity is a feast for those of us (me! me!) who love color and light. It also introduces my all-time favorite watercolor technique—working wet-in-wet within shapes—which you can adapt to all sorts of other situations. Best of all, it’s just about guaranteed to produce beautiful results, even if you are brand-new to watercolor. NOTE: This is a great activity for older kids. If your journaling/art companion is too young for the design and watercolor technique described here, there are many sites online with mandala designs you can print out and color. Click here for one such site. As I’m sure most of you know, mandala simply means circle or disk in Sanskrit. 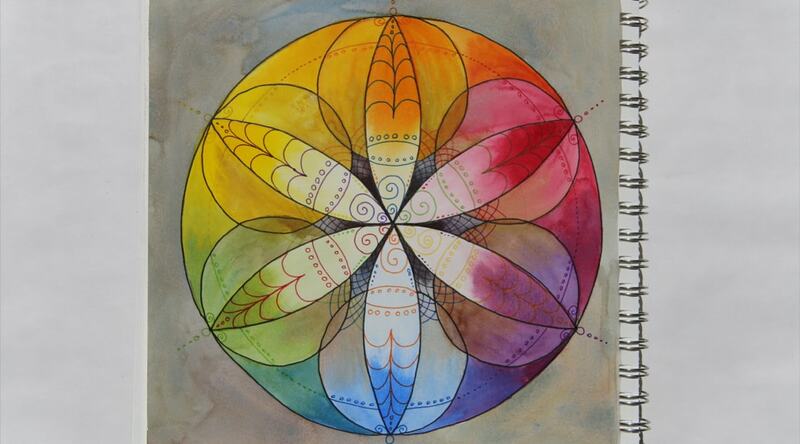 Mandalas and circular artworks have a rich tradition in many cultures. I’m going to leave it to you to read more about that on your own, if you’re interested. Here are a couple of links to get you started: a Wikipedia article on mandalas, and an article on the Exotic India website, and another article on sand mandalas in Tibetan Buddhism. Circles and circular artworks are significant to pretty much every culture. Mandala has become common as shorthand for any circular or radial artwork, and that’s how I’m using the term in my journaling. It’s interesting how the format you choose to work within affects both the look of an image, and the insights you derive from it. We spend a lot of time with rectangles of various sorts, from the shape of the rooms in most buildings, to the format of our journals. Working with a circular format is a great way to shift yourself into a different mode of thinking and stimulate your creativity. Besides, circles and radiating images are visually appealing! Circular art feels more open. It has movement and radiates light and color. And, circles have powerful symbolism: the Universe, wholeness, the womb (and hence, female energy), sacred space, wheels and movement. What do circles represent to you? Finally, our bodies naturally move in circular arcs, so circular artwork feels pleasing to make. Draw Your Circles the Easy Way! I hope by now you know that my philosophy is to use whatever is available to make our journaling easy and stress-free! There’s no reason to feel you have to draw your circles freehand. Circle templates, compasses and circular household items can help you draw your circular designs. Circle templates—You can often find these in the drafting supply section of office supply stores and art stores (or online, of course). A compass—But, please save yourself some headaches and buy a decent one intended for technical drawing (office supply or art supply stores have them), not a “school compass”. School compasses usually start slipping after very little use, and are the reason most people think they can’t use a compass. Look for one with a knurled wheel for opening and closing it. This type stays where you set it, instead of slipping open while you’re trying to draw with it. If you’ve never used anything by a school compass, you’ll be amazed how much easier it is to work with a good one. A good compass can be had for under $10. Plates, container lids and other household items—You probably have a wide variety of circular lids and containers around the house. All it takes is a little scrounging to find circle templates of many sizes. Construct your work radially from a central point—You don’t need to draw perfect circles to make “circular” art forms. One way is to let them develop organically by starting in the center and working outward. You may like this way of working if a less “geometric” look appeals to you. For this activity, you’ll want to start with a pencil drawing indicating the “skeleton” of your circular design. Start with a large circle. Using smaller circles, arcs or straight lines, divide your large circle up. Most of the time, I do this symmetrically, repeating the same shapes in each section. Circular designs with eight-fold and six-fold symmetry. You can divide a circle into fourths (and then, if you wish, into eighths) fairly easily with a ruler. Or, you might remember from grade school that you can use a compass to divide a circle into sixths. step 1: Draw your circle, and don’t change the setting on your compass. step 2: Place the point of your compass somewhere on the perimeter of the circle and swing it around until the pencil is over the perimeter, too. Make a small arc crossing the perimeter of the circle. Place the point of the compass on the perimeter of the circle and draw a small arc where the pencil intersects the perimeter. step 3: Move the compass point to the place where that small arc crosses the perimeter and make another arc in the same fashion where the pencil crosses the perimeter. Move the point of the compass to where the first arc intersects the perimeter of the circle. Draw a second arc in the same manner as the first. step 4: Repeat until you are back to the beginning. If you have been careful in placing your compass point each time (and your pencil isn’t too dull! ), you’ll finish up right where you started and there will be six small arcs evenly dividing the circle. When you’ve gone all the way around the circle in the same fashion, you’ll have six arcs evenly dividing it. You can connect your six small arcs with a ruler to divide the circle like a pie. Or instead of just making a small arc, you can swing the compass all the way through the middle of the circle and you’ll wind up with six “petals”. I like to use a combination of straight lines and arcs to divide up my circles. And I also like to use smaller circles inside my larger circle. Method 2—Work outward from the center in a radiating fashion. If you like, you can use a lightly drawn circle or some crossed lines to give you a little structure, or you can work completely freeform. Both are appealing. In this method, you start with a shape in the center and keep adding lines and shapes working outward. Regardless of which method you use, for the stained-glass mandala, you’ll want to avoid really teeny shapes until you’ve had some practice (you’ll see why in a moment). But, in general, you can make your “skeleton” as simple or as intricate as you wish. There is no right or wrong way to do this! Now that you have a design, it’s time to add color! We’re going to use a very easy watercolor technique called “working wet-in-wet within shapes”. What we do in this technique is wet one area of the design at a time and drop in wet watercolor in the corners and along the edge, allowing the color to spread along the wet paper toward the center of the shape. It’s important that fill the shape with enough water that there is an even sheen of water on the surface, but not so much that you have a big puddle. If you accidentally put too much water in your shape, dry your brush on a paper towel and use it like a mop to drink up some of the excess water. It’s not as hard as it might sound. The pictures should help make it clear what to do, but a little practice is also required to figure out how much water you need and how wet your paint should be. IMPORTANT NOTE: Watercolor moves wherever it finds water on the surface of the paper. After you finish one shape, move on to one that is NOT adjacent, so that you don’t have two wet edges next to each other. Come back to do adjacent shapes when the wet shape is completely dry. Use your brush to wet one section at a time. You want a nice sheen of water on the surface, but not a huge puddle. If you have too much, dry your brush and use it as a mop to drink up the excess. Now, use your brush like an eyedropper to put a little concentrated wet color in the corners or along the edges of your shape. Let the color move over the wet paper towards the middle of the shape. If the color spreads more than you wanted, try using a bit less water next time. If it doesn’t spread enough, add more water. It’s a bit unpredictable, and that’s part of what makes it beautiful. Each shape will be a little different, just like different pieces of art glass. Here’s how it looks after you’ve done a few shapes. Beautiful, isn’t it? Stained-glass mandala after a few shapes have been colored. Notice how I’ve avoided working on shapes that might be next to a wet area. I’ll come back and do them when these shapes are completely dry. I almost never finish one of these mandalas in one sitting! Often, it will take me a couple of journaling sessions to get the design drawn, and several more to add color. I call this the “ick!” stage. They always look so lovely after the first few areas are done, like a few jewels on a snowy white background. When they get to the point that about half the paper is covered, you may feel you’ve ruined what was a promising start. (Especially if you have had some drips and smudges, as I have here.) Don’t give up! It’s not ruined; it’s just not finished! All watercolors go through this stage. The solution is to keep painting! Here’s how it looks “finished”. Of course, “finished” is never for certain in my journals. I might decide to come back and do more to it later! This is how it looks “finished”. I put that in quotes because you never know! I might decide to do something else to it later. You can do this purely as a relaxing exploration of color and shape, or it can form the basis for mandalas that represent some kind of energy, perhaps as a meditation focus for something you want to bring into your life. Or, you might want to use this as a nonverbal way to record, celebrate or explore something in your world or your life at the moment. The colors and shapes in this mandala were chosen to celebrate several days of stormy weather, with lush green leaves dancing in the wind and a few purple and pink wildflowers accenting all the beautiful greens. Here’s another one, inspired by the sun breaking through after a fierce thunderstorm. (Can you tell I love stormy weather?) This one is actually a more polished version that I used to decorate a drum. Not all of my mandalas are so neatly executed by any means! In next week’s post, I’ll describe some more ways to use a circular format in your journal. I’ll give you some ideas for using mandalas to find wholeness and balance, to reconcile “opposites” or conflicts and to create a mood or bring a particular energy into a space or your life. I love making mandalas and I hope you do, too! As always, please feel free to share ideas or images in the comments, or on our Facebook page. A footnote: I discovered a lovely YouTube video posted by ExpressingtheSelf.org describing how to make a mandala working outward from the center. The artist in the video works very neatly and regularly and arrives at beautifully symmetrical mandalas. The ones in the video are probably too detailed to be the basis for a “stained-glass” mandala, but it’s a fun way to create a different type of mandala, so I thought I’d share it with you. My results were nowhere near as neat and regular as the ones in the video. I was hurrying to add it to this post and not working “with care” as the artist repeatedly suggests! But even so, I rather like the result, and I thoroughly enjoyed the process.